When I started planning my first mystery novel three years ago, I should have taken more time to read about the craft of writing first. I would have avoided a ton of mistakes. But one thing I did right was to seek the advice of smarter people and to learn from their experience. Today I have the privilege of featuring Daryl Wood Gerber aka Avery Aames. As AVERY AAMES, she pens the Agatha Award-winning, nationally bestselling CHEESE SHOP MYSTERY series. As DARYL WOOD GERBER, she writes A COOKBOOK NOOK MYSTERY series. 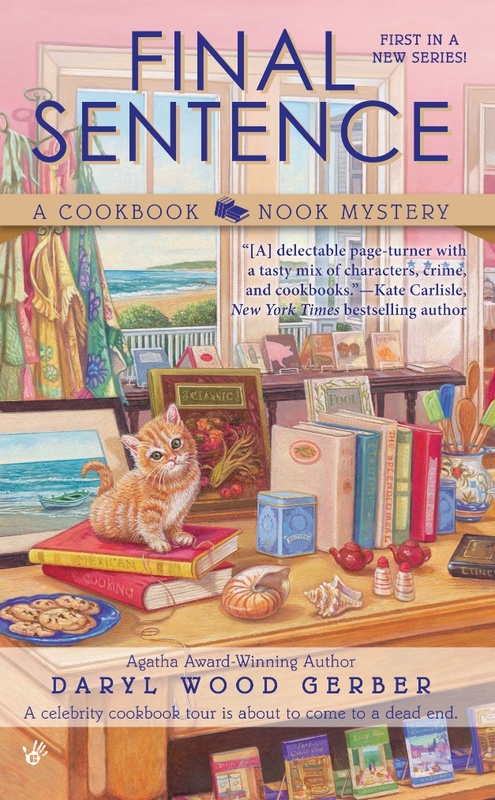 FINAL SENTENCE, the first book in the Cookbook Nook series, debuts on July 2 (Berkley Prime Crime, a division of Penguin Books). The story features Jenna Hart, a former advertising executive, who leaves the corporate world to help her aunt open a culinary bookshop and cafe. Back with her family in Crystal Cove, California, Jenna seems to have all the right ingredients for a fresh start—until someone adds a dash of murder. Daryl’s short stories have been nominated for the Agatha, Anthony, and other awards. As an actress, Daryl has appeared in “Murder, She Wrote” and more. In additional to juggling two mystery series, Daryl also takes time to encourage new writers through the Guppies group of Sisters In Crime. Recently I asked her some questions about her own experience as a mystery writer. Q: What is the one thing you wish you had known starting out? How long it was going to take. Truly. And how much better prepared I should have been for the business side. I had no idea there would be so much promotion involved. Facebook, Twitter, a website that needs to be constantly updated. I would have liked a shelf filled with how to write books, and I would like to have read them all, front to cover. Check out Chris Roerden’s book, Don’t Murder Your Mystery, and Hallie Ephron’s The Everything Guide to Writing Your First Novel. I wish I’d been part of a critique group from the beginning so I’d had feedback on my writing. Q: What is the most important thing you learned writing and publishing your first book? How much I have to balance my time with writing, doing PR, and having a life. I need to be very disciplined to get it all done. Q: What is the biggest mistake you made? My biggest mistake was sending out material before it was ready. As I wrote above, I should have been in a critique group long before I finally found one. I should have been taking more classes and really polishing my prose. I should have truly understood the hero’s journey. Q: What advice would you give to emerging writers? Read within your genre and without. See what’s selling. Get a list of agents and see what they are selling. Submit to agents who sell your kind of book. Don’t waste your time submitting to agents who do not sell your style. Go to conferences, if you can afford to, where writers meet agents. Learn how to pitch your book. I have made a YouTube video called The Elevator Pitch [Note: there are a few with that title; this is the one with me in a pink jacket, elevator doors open…]. Take a look. It shows you the bad way and the good way to pitch. Hone your pitch to 30 seconds…with a smile and energy. Don’t get discouraged with rejection. It happens to all of us. Take in the comments, if they are reasonable, and allow your work to grow. Learn. Listen. Persevere. Don’t give up. If you give up before you are published, you will never be published. It’s that simple. Believe you can. But realize it might not happen with your first or even your second book. You can visit Daryl & Avery at www.darylwoodgerber.com and www.averyaames.com (where you can sign up for her newsletter to learn about upcoming events and contests). Check out her fabulous recipes on her blog www.mysteryloverskitchen.com. And friend her on Facebook. Thanks, Melissa. Ms. Gerber is a wonderful writer herself and a great encourager of those who are just entering the field. Hope to hear more from you in the future. Wonderful interview! =) Great advice! I’m sorry I’ve been away – but glad I was able to swing by to say – what a great post. I love the inside scoop! Hope you’re having a productive wonderful summer! Hi Susan, I’m just about to read your latest. Hope you are having a great summer.